The Horror Movie BBQ: Flea Market 2015 Season Kickoff! 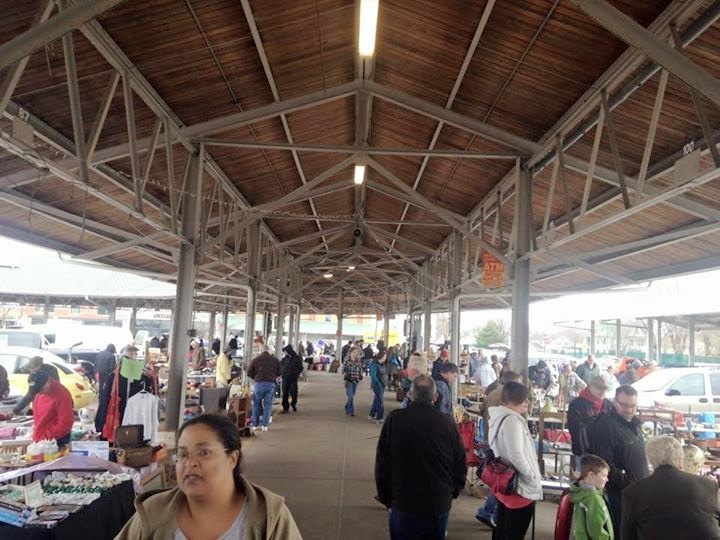 Finally, after a few months, the flea market downtown reopened for the first market of the season. And boy oh boy, I couldn't take it much longer. The wait was getting so excrutiating. Sure, thrift stores are a good way to feed the bargain/treasure hunting hunger between seasons but nothing beats the great tradition of going to a flea market. Hot dogs, baseball games and the beach? Nah. My summer traditions always consist of going to flea markets and yard sales. Now, I got the sense early on I wasn't going to walk away with anything. It's the beginning of the season, so it's not uncommon to walk away with nothing. And of course, you can't get too upset either. You've got the whole season of rummaging through peoples smoke filled WWF magazine stacks ahead of you. Don't lose hope on your first trip. And after all my years of doing this, I find that abandoning all hope is the best way to tackle a flea market. Oh yes. OH YES. Please! 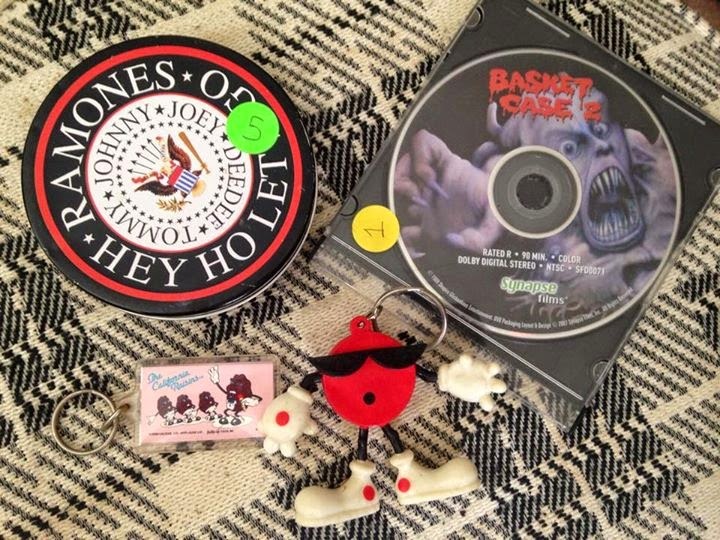 A set of Ramones coasters, a copy of Basket Case 2 on dvd, a California Raisins AND Coolspot keychain! The damage? 5 bucks. I was able to talk the guy who sold me the Ramones and Basket Case 2 down from 6 for both to simply $3.50 for both. Not too bad, eh? Especially since my rabbits have chewed up all my coasters. But these are perfect replacements. I gotta admit, I've only seen like 5 minutes of Basket Case 2, so I don't truly remember much about it, but for a buck, it's worth it. YES! 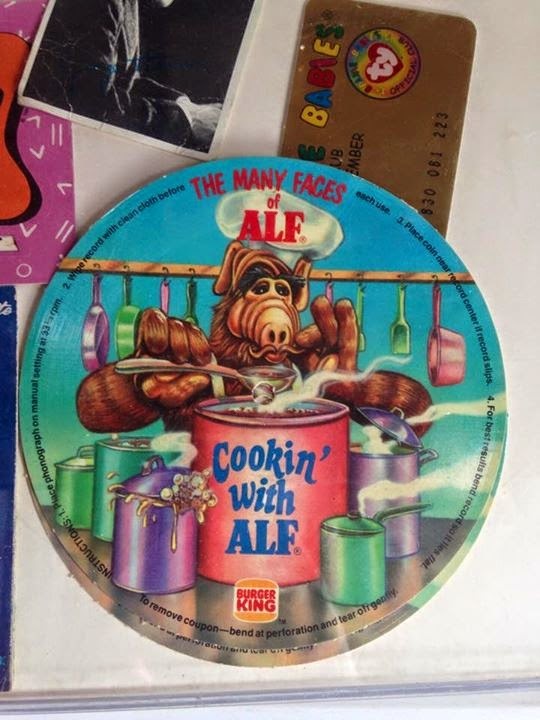 Alf lunchbox and the Cookin With Alf record from Burger King. I was wildly into Alf as a kid. I still am, obviously. But I had everything Alf including these two items. 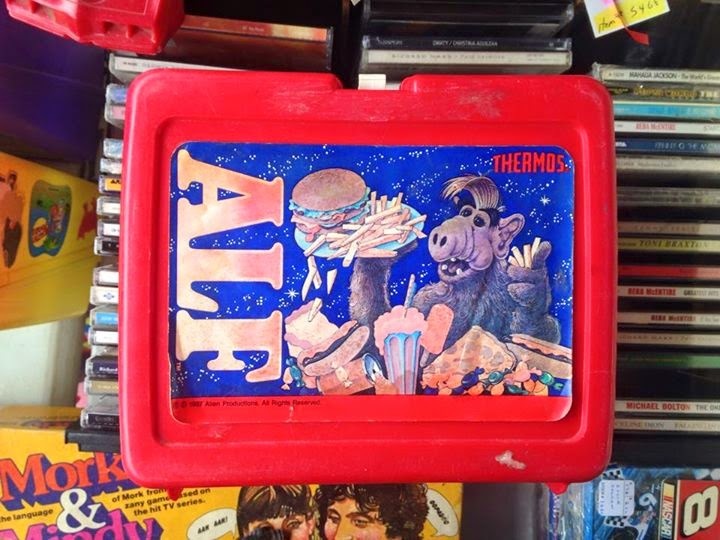 The Alf lunchbox was my first lunchbox that I took to preschool and the Cookin With Alf was a sweet ad-on that came with those awesome Burger King puppets. 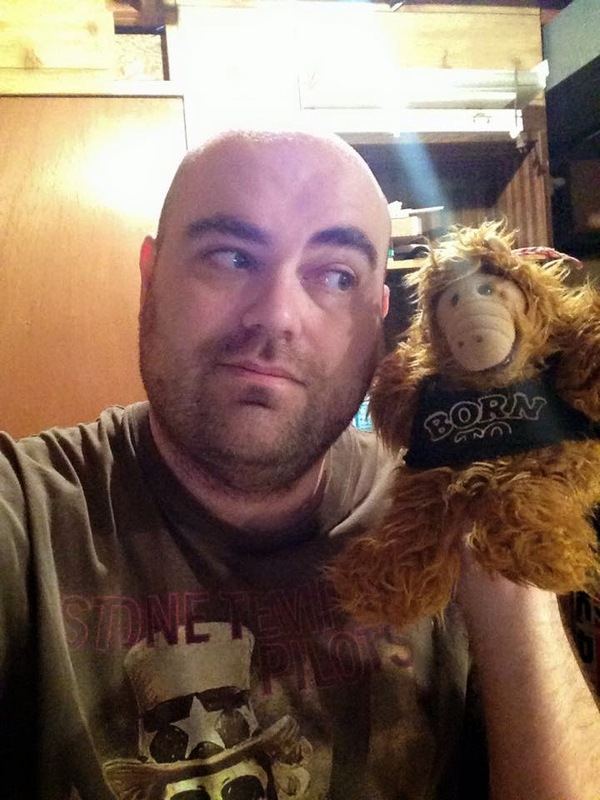 In fact, I still have my Rock-N-Roll Alf puppet. See? I love Alf even to this day. So both of these items made me very happy. A sassy Bart Simpson poster! YES! 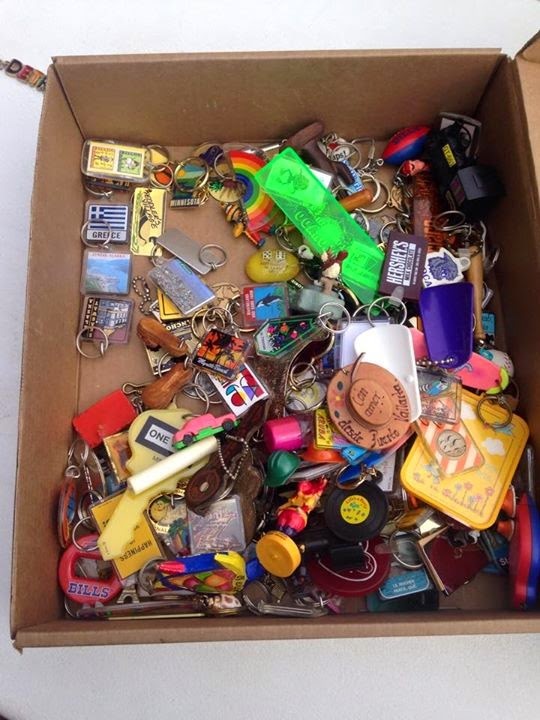 Every 8 year old boy had these! 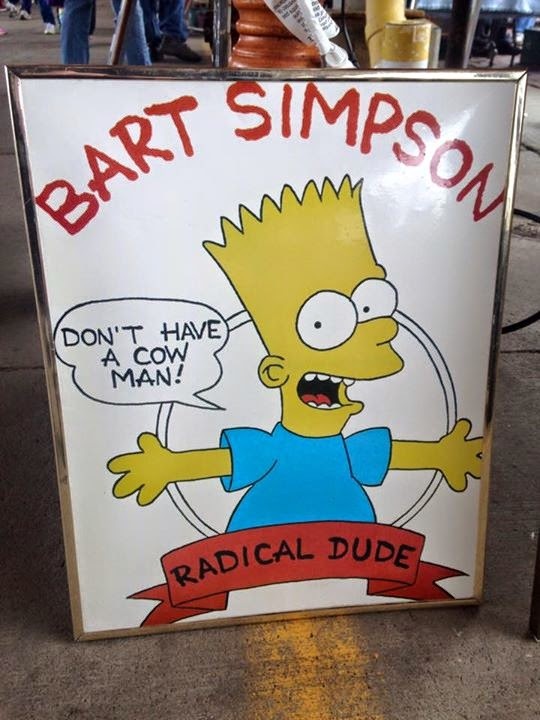 Usually the rebellious posters had Bart spouting one of his dangerous catchphrases like the one you see above or "Eat My Shorts!". These were great and everyone in my neighborhood and social circles had one. Compared to the merchandising today, this stuff was pretty simple. But that's how we liked them: In your face and simple. So, my haul was great, but the overall experience was just as great. I can't wait for the rest of the season. It'll be hard to top my finding a copy of Video Dead on vhs for .25 last year, but I get the sense it'll be a great time this season. Great haul so far! I can't wait to start my flea market binging! Excellent finds my man! Basket Case 2 is so-bad-it's-truly-awesome, and those key chains are so frikkin' anazing! Great finds!!! I just got a FREE BURGER KING GIFTCARD, this promotion is open for everybody, CLICK HERE to participate and win your free giftcard.